St Augustine Girls High School cheerleaders will be making their debut at the World Cheer Championships on Orlando, Florida this weekend. THIRTY-TWO girls from St Augustine Girls High School (SAGHS) Star Firez and St Joseph's Convent (SJC) Port of Spain Scorpions will leave for Orlando, Florida today to showcase their talents at the World School Cheerleading Championships. It will be for many of them a once-in-a-lifetime experience, competing at an International Cheer Union-sanctioned (ICU) event at the ESPN Wide World of Sports Complex in Walt Disney World Resort. The Championships start Friday and end Sunday. SAGHS will make their debut in the medium size division (14 members), while SJC – set for their second appearance since 2017 – are in the large (18 members). Both are competing at Level II. 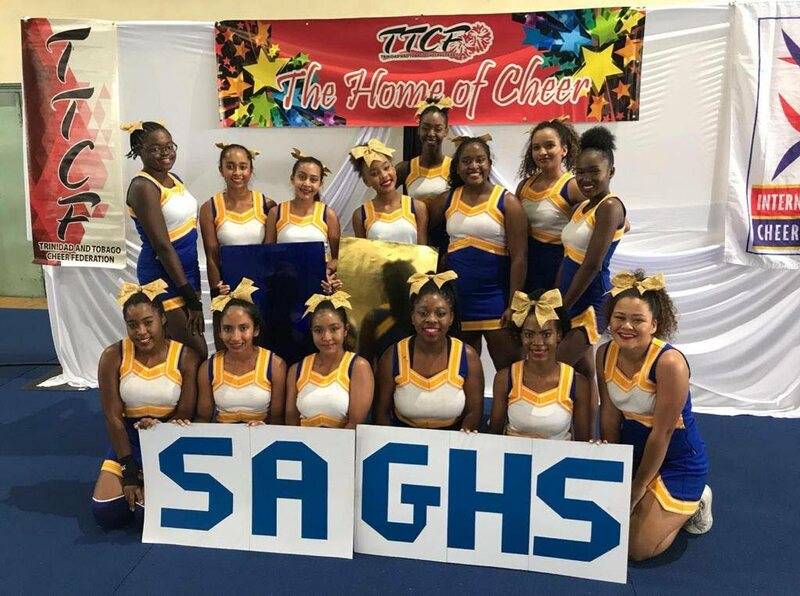 SAGHS' cheerleaders are confident and at ease heading to the event, having trained consistently since the TT Cheer Federation (TTCF) National Cheer Championship last year, where they dethroned long-time winners SJC Port of Spain for their first title in the intermediate division. Champions SAGHS and runners-up SJC qualified for the World School Cheerleading Championships from the TTCF national event. The two teams had their final training at the Jean Pierre Complex, Mucurapo, Sunday, where they were given the opportunity to familiarise themselves with the students from the other school. Leading SAGHS as team captain is Shae-Marie Aaron. Aaron, 18, is in her final year at SAGHS and said she wants to use the opportunity to encourage her peers and younger girls to get involved in cheerleading for the physical and psychological aspects to the sport, as well as the opportunity it provides. She said, "When I started (four years ago), I was in swimming and football but now it's just cheerleading. I like the team spirit of football and cheerleading but then I like cheerleading more because of the difficulty. It's the same physical aspect but you also have to smile and perform, so I liked that – and I like dancing. I like that football is physical, but with cheerleading you give a performance." Aaron said it was her friends who urged her to start cheerleading and she does not regret taking their advice. She said, "I also like coming to practice and seeing my team-mates. They're a great group of girls, so I like spending time with them. And then, at the end of practice, you just kind of feel accomplished because we do certain skills. Every time you hit a skill you feel accomplished." Aaron said the sport has helped her personally as well. "I feel a lot more mature. It's a very logical sport. You always have to think about what's next," she said, adding, "You're never relaxed and it's very challenging. It strengthens your core, your arms; everywhere gets more muscular." Undoubtedly, one of Aaron's major plans for Orlando – as with most of her peers – is to visit Disney's famous attractions. With her time at SAGHS drawing to an end, Aaron wanted to thank her coaches, the school and federation, saying she hopes to continue to cheer at a university in Europe. "This will be my last year at the school and with coach Sharon (Dookie), and I would like to say thanks (to her). I had an amazing four years and it's taught me a lot and I would like to encourage others to join so the sport can grow and so they can enjoy everything I've enjoyed," she said. Coach Dookie said she has one objective for the team, which is to and show that TT can do the sport of cheer. Dookie, a TTCF certified Level I & II coach who has worked with SAGHS for over five years and been on a previous trip to Florida, said, "When we go out there, a lot of the US teams are shocked to see TT on the mat for cheerleading, so we – the federation on the whole – want to show the world that we can compete in the same sport. "It's to give a good show, to make sure the girls execute well and that when they leave the mat, they've left everything on the mat and they walk off proud – proud to know they represented their school and their country well." Dookie said the parents, teachers, current students and past students have all been very supportive of the SAGHS team's endeavours through the various fund-raising initiatives. They otherwise received support from the SAGHS' parent-teacher association, Friends of SAGHS, SAGHS alumnae, Excellent Stores, Subway (Prestige Holdings Ltd), Brand Source and the TT Cheer Federation (TTCF). SAGHS Star Firez squad: Shea-Marie Aaron, Amelia Ahwai, Adrienne Baptiste, Nadia Bhola, Robyn Bhola, Kamilli Campbell, Raejeanne Carrington, Dillana Clopton, Aquelah Francis, Shemiah Grant, Azara Hosein, Kurnisha Plowden, Amaya Perreira and Jaydah Smith. St Joseph's Convent Scorpions squad: Kaitlin Camacho, Chena-Marie John, Gabriella Thong, Gabrielle Gaulteau, Caitlin Gaulteau, Michelle Lue Fatt, Roshelle Lue Fatt, Chelsea Mc Comie, Aaliyah Mohan, Ttiana Mohan, Cecilia Qui, T'chelle Cedeno, Tyla Raghunanan, Sade Flemming, Kerisse Titre, Zahra De Freitas, Zoe Butts and Caylah Pereira. Reply to "SAGHS to make World Cheer debut"